I wasn’t sure if I would get all the teeny tiny Churn Dash blocks made this week, but the two blocks were sewn together this morning. 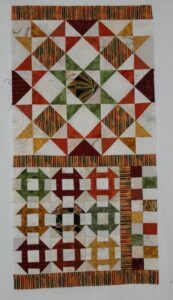 There is one more block for the bottom and then this section (2) will be completed. 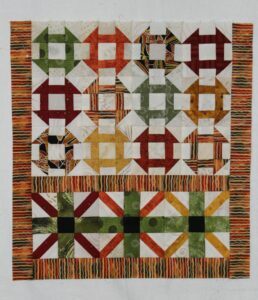 Applying the sashing after each block is finished will make the final construction of the quilt block easy and helps me balance colors in the remaining blocks. Here is part of section 5. The block for week 8 is Courthouse Steps and three of them will be attached to the right side.